Hydro Dermabrasion Water Oxygen Jet, Personal Facial Care Beauty Equipment - High quality Taiwan Hydro Dermabrasion Water Oxygen Jet, Personal Facial Care Beauty Equipment provides by Jean-Modern's Ind. Co., Ltd.
Hydra facial dermabrasion is unexciting NEW technology that combines the efficacy of micro-dermabrasion, vacuum system and new Aqua Fuse hydration system. It is much gentler than crystal micro-dermabrasion or diamond dermabrasion as only water is used, It is a professional equipment for cleaning face without any side effect. Hydra dermabrasion applies mechanical and chemical peeling simultaneously. It includes a water jet, a two-way flow control valve, a purified container and a waste water tank. Unique hydra dermabrasion tip jets out thin and tiny stream of water and polish skin in high speed by vacuum suction, the liquid from which helps moisture skins in the mean time. The main advantage of such hydra dermabrasion machines lies in that it is much gentle by using only water, and enables treatment diversification by using with skin care products for different functions like essential oil, whitening products, lactic acid, salicylic and more, to achieve various aims on customers' request. 1. hydro dermabrasion, applicable to regular or sensitive skin, or skin with whelk, comedo, acne, etc. 2. cleaning & washing: deep cleaning, clear skin rheum, minimally invasive scar, and clearing blackhead, remove deep skin dirt. 3. effective and direct moistening: supply sufficient water molecules to skin while clearing. removal, skin lightening and whitening. Water supply: supply sufficient water molecules to skin while clearing. Rehabilitation: improve dull skin, shrink pores, smooth skin, repair skin cells. 1. Connect power cord. AC11OV-240V. 2. Pull out water container and Pour purified water in the bottle. 6. Press Stop when there is not enough purified water during treatment. 7. Press ON/OFF again, stop working. 8. 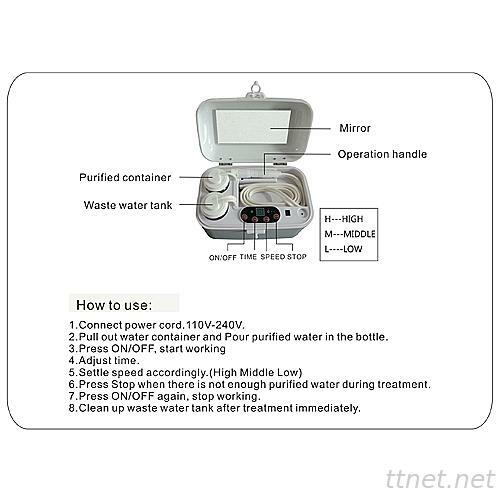 Clean up waste water tank after treatment immediately.